THANK-YOU, THANK-YOU!! To Badger Mama who was my Santa Swap Buddy!! Badger Mama was so thoughtful! She sent me a sweet Rudolph book for Jack. Some Austin Nuts that my Hubs is still talking about and are not in the pic because he ate them ALL!! Some yummy smelling soap! That she made!!! How great! A cute plate, some great lip gloss and some other great goodies! Thanks espically to Shannon at The Mommy-Files for organizing such a fun swap!! This was my first time participating and I really had fun! THANKS!!! 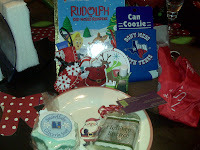 This entry was posted in Uncategorized and tagged Blogger Santa Swap, CHRISTMAS, Hickory Mom Blogger, The Mommy-Files.